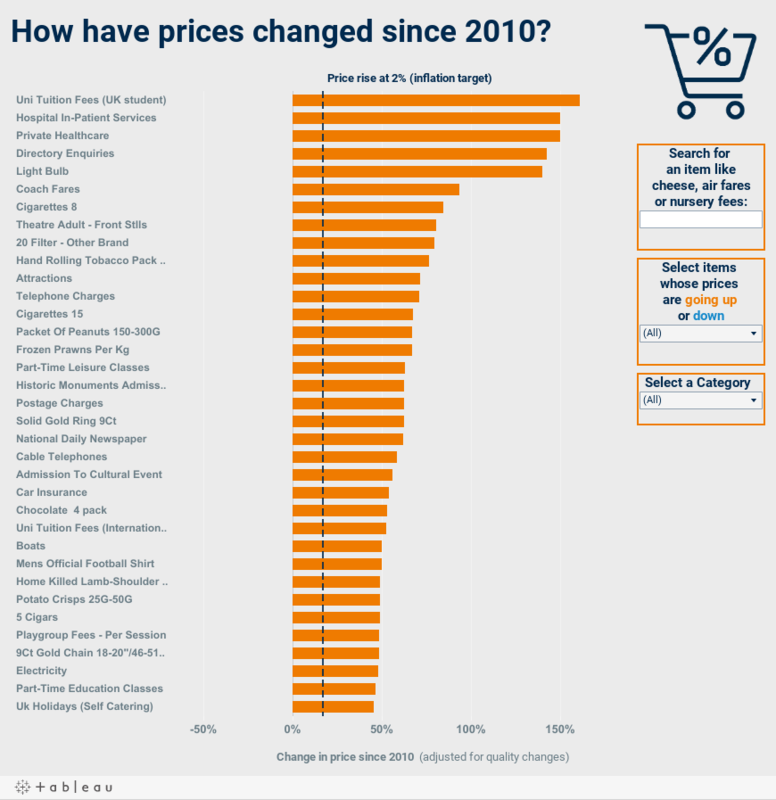 Home / KnowledgeBank: the economy made simple / How have prices changed over time? Prices have gone up by 2% on average per year since 1997. It is difficult to imagine a day where we don’t spend money. A typical household in the UK spends over £500 each week. But how have the prices of products changed over time? Every month a team of specialists collects around 180,000 separate prices of about 700 items covering everything from a pint of milk, to the cost of a football ticket. Over the past 30 years, the price of a typical basket containing all of these items has roughly doubled. But within that super-sized basket, the price of some items has risen much faster than that. And the price of other items has hardly changed at all. Let’s look at the price of the two items mentioned earlier – milk and football. The price of a pint of milk has doubled since 1990. That works out as an increase of around 2% each year, in line with the typical basket of all items. Meanwhile the cost of watching football has rocketed. Over the same period the price of a match ticket has increased more than six times, or around 8% each year. Think of a shopping basket filled with things we typically buy. Inflation is the rate of increase in the prices of the items in that basket. A little bit of inflation is fine. But high and unstable rates of inflation can be harmful. Zimbabwe in the 2000s is a good example For example, Zimbabwe experienced this in 2007-2009 when inflation rates rose to a peak of around 80 billion per cent each month. As a result, people simply refused to use Zimbabwean banknotes and the economy ground to a halt. How do we make sure prices don’t rise too quickly? Here at the Bank of England it is our job to make sure that there’s a limit to prices rising, as this supports a stable and healthy economy. We have a 2% target for inflation (given to us by the Government). The price of some things might go up by more than others – and some prices might go down but on average the price of items in the shopping basket should go up by 2% each year if we are meeting our target. To meet the inflation target we use a key interest rate in the economy, known as Bank Rate. If inflation looks like it might go above our target we would probably increase interest rates, so people spend less - which tends to reduce inflation. Or if inflation looks likely to fall below target we would probably cut interest rates to boost spending in the economy and help inflation to rise. For instance, following the uncertainty caused by the vote to leave the EU, we cut interest rates (and announced other measures to support the economy) in August 2016. Since the Bank of England began targeting inflation in 1997, inflation has averaged about 2%.